Leading up to the kick off on October 3, local leaders for the 2016 Great Places designations worked hard to plan local events while keeping the embargoed secret close to the chest. Through hushed invitations and cryptic media announcements, the planners were able to arrange successful events with speed and aplomb. Great Places celebrate their designations in many different ways, from simple announcements at local planning meetings to high-energy kick offs of local festivals. No matter what the event entails, the recognition of the hardworking planners that made the Great Neighborhoods, Streets, and Public Spaces is heartwarmingly well-deserved. 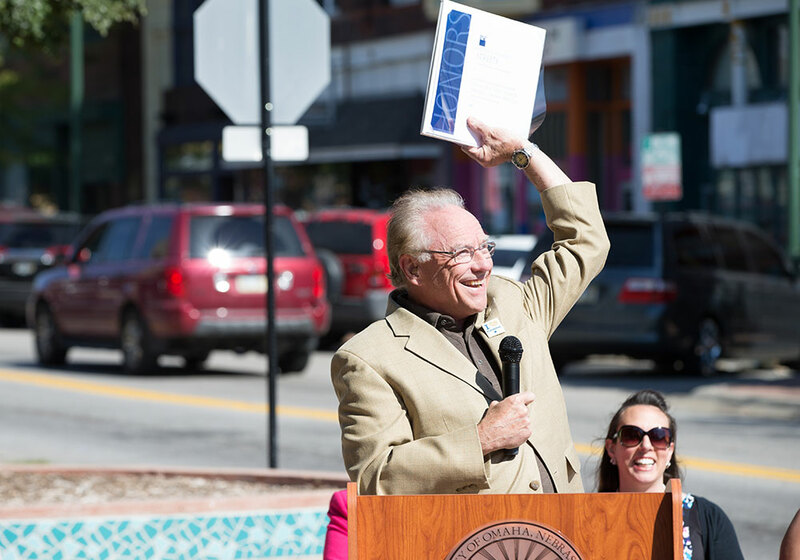 Omaha City Council Member Garry Gernandt joyously raises the Great Streets certificate at the national announcement on South 24th Street Business District. Photo courtesy Don Shepard Photography. This year’s events kicked off with the October 3 announcement on South 24th Street in Omaha, Nebraska. Omaha Mayor Jean Stothert, APA President Carol Rhea, FAICP, and number of excited city officials took to the Plaza de la Raza just west of the intersection between South 24th and N streets. The day was bright and sunny, but it couldn’t compare to the smiles on Nebraskan planners’ faces when the certificates arrived. Celebrating Midtown Atlanta as one of the 5 Great Neighborhoods for APA's 2016 Great Places in America. Video courtesy of Midtown Alliance. October 4 was blessed with a deluge of events. Midtown Atlanta had an outpouring of local support for its local announcement. Popular vendor King of Pops handed out free craft popsicles to attendees, and Mayor Kasim Mayor took to the stage alongside the Midtown Alliance to remark on the vibrancy of the neighborhood. After the Albuquerque city planning director, APA New Mexico chapter resident, mayor and main street president all presented, Nob Hill capped its Great Neighborhoods announcement with ART Beat on the Street at O’Neill’s. James Rausse, AICP, President of the APA New York Metro Chapter; Ruben Diaz Jr., Bronx Borough President; and Courtney Mercer, AICP, APA Board of Directors from Region 1, enjoy Italian snacks as they revel in the Arthur Avenue Great Street designation. Photo by Michael Johnson. APA New York Metro chapter leadership presented the Great Streets designation for Arthur Avenue to Bronx Borough President Ruben Diaz Jr. and celebrated their achievement at the famous Italian market down the street. For the first time in Great Places history, APA livestreamed the event using Facebook Live. At Central Park Plaza, a local favorite in the tiny town of Valparaiso, held a charming celebration to honor their creative town planners who shaped its Great Public Space. October 7 marked Golden Heart Plaza’s local event. Fairbanksans braved the chilly evening by huddling around fire pits and roasting s'mores, paired with free coffee and hot chocolate. Mayors Karl Kassel and John Eberhart received the award, followed by a short presentation on the history of the plaza. Group photo with the Old Louisville community organizers that have helped make Old Louisville One of the Great Places in America. Photo courtesy Force Media. October 14 was another popular day for Great Places events. Fairmount Park kicked off its Senior Strut with its Great Places announcement, highlighted by an appearance from the beloved Philadelphia Mummers. Old Louisville held its event that morning as well, where Louisville Mayor Greg Fischer and APA Kentucky President Amy Williams mingled with Congressman John Yarmuth over light refreshments in the Historic Old Louisville Visitors Center. Finally, Findlay Market celebrated its Great Public Space designation in the early afternoon with music and an excited photo op with the market merchants. The Great Places announcements provide communities with an amazing opportunity to showcase the hard work that goes into shaping these incredible neighborhoods, streets, and public spaces. Think your community deserves such fanfare? Nominate your favorite place for our 2017 Great Places in America designation — we can’t wait to keep celebrating.